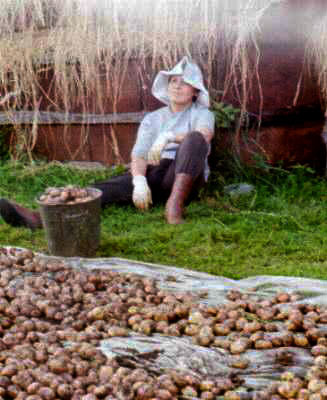 My aunt takes a break while digging potatoes. Behind her is a structure to store them in during the winter. While most Russians live in cities, they usually have a dacha or summer cottage. This is a place outside the city where they can garden and recreate. Some of them are quite elaborate while some are no more than a garden with a small storage shed. The size of a dacha is usually about like a city lot in an American residential area. Now, because of the difficult economic situation, Russians who are not paid their salary for several months try to make ends meet by using their dacha's crop for food and sale.